Home » News » What is Team Bar Finder? What is Team Bar Finder? Call it what you will. Team bar. Game watch tavern. Supporter pub. No matter what name you use, finding a public place to watch your game surrounded by like-minded fans while away from your team’s city has been difficult, unreliable and time consuming. That was before we created team Bar Finder. 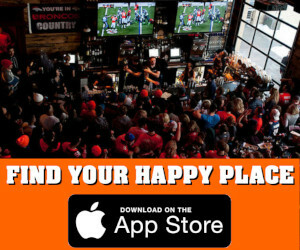 Simply stated, Team Bar Finder locates bars and restaurants showing your favorite teams’ games surrounded by other like-minded fans. Select your favorite team and where to watch, Team Bar Finder does the rest. 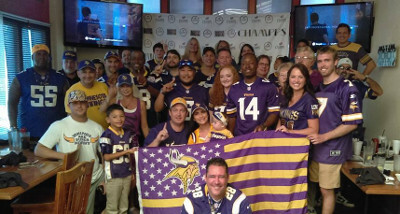 There are literally thousands of team bars and locations that host watch parties for fans of teams that are not located in their favorite teams’ home market. We call these supporters Displaced Fans. This atmosphere and environment creates that feeling of being back home rooting on your favorite team even if you are miles away. 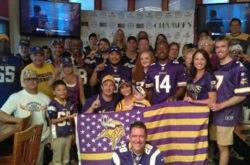 Minnesota Vikings fans in Miami gather at Flanigan’s Seafood Bar and Grill. Whether you are accessing the vast database of team bars on the web or via the Team Bar Finder mobile app, Team Bar Finder takes the guess work out of finding your team bar surrounded by your fans. If you are unsure on how to find your team bar on our TeamBarFinder.com website, we suggest visiting our Getting Started page. There you will find hints and tips on how to use our huge database of team bars. If you are using the Team Bar Finder mobile app, we suggest reading the description in the app store. Plenty of instructions on how the Team Bar Finder mobile app works are available there. The Team Bar Finder mobile app description will be updated with each new version release. Lastly, if you know of a location that is friendly to out of town fans, please use our Submit a Team Bar page to alert us of any location that may have recently opened or is not in the Team Bar Finder database. If a team bar has closed, is no longer affiliated with a particular team or is no longer welcoming displaced fans into their establishment, please alert us by using our Contact Us page. Thank you for visiting and we would love to receive any feedback you may have.